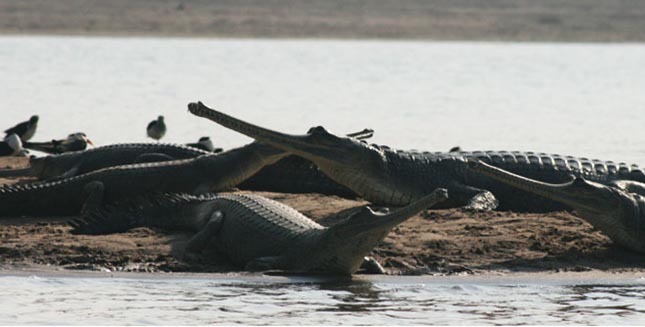 • Largest population of Gharials;(scientific name- Gavialis gangeticus) are found only at National Chambal Sanctuary. • The National Chambal Sanctuary was established in the year 1979. • It was established as a riverine Sanctuary. • National Chambal Sanctuary is the zone where the crocodilian species Gaharial are re-introduced. • Platanista gangatic - Gangatic Dolphins (National Aquatic Animal of India) are also found in this area. • Out of 26 turtle specie found in the country, Chambal alone supports 8 rare species of turtles. • Chambal River is counted amongst the cleanliest river in the county. • More than 320 resident and migrant birds are found in National Chambal Sanctuary. • National Chambal Sanctuary is the only place where the nesting of Indian Skimmers has been recorded in large numbers. • The maintenance of the sanctuary is looked after by the wildlife wing of the Uttar Pradesh Forest Department. Headquarter of the department is situated in Agra.